This morning Microsoft sent us a guide to the new Microsoft Office. It’s 53 pages. It reviews every feature imaginable. Read though the document and it’s evident Microsoft did what it had to do. It integrated with Office 365. It developed an elegant touch user interface. It took the best of Metro to make Microsoft Office relevant. But Microsoft has an issue with its licensing. It’s complicated. And that has the potential to hinder adoption. Microsoft wants to make Office 365 accessible to consumers with more sophisticated features for enterprise users. But the licensing is such a bear. It requires a deep study of what you already have to decide how to actually license the new Office and leverage its cloud offerings. For example, Microsoft has announced cheaper, better BYOD support for the Windows client OS, but you might face significant extra costs for Microsoft Office if you enable it for BYOD unless you take care to avoid them. Microsoft is uncomfortable with offering “free” services that makes integration simple. It points to a fundamental issue with its entire licensing structure that in turn reflects on its cloud offerings for enterprise users. It shows in Office 365 slow adoption. I asked one executive today wo has a service which integrates with the Microsoft Office desktop version but not Office 365. He said Office 365 does not have enough critical mass to integrate. Further, Microsoft has a closed architecture. It lacks the APIs that would make it possible for his company to integrate with the service. Google Apps features are good enough for most people. Its licensing is simple. You start with free for up to 10 users. You pay $50 per user once you add more people to use it. It is open with its APIs. I had a taste today of the Microsoft Office issue. The “new Office Reviewer’s Guide,” opened in my Chrome browser to a SharePoint file. 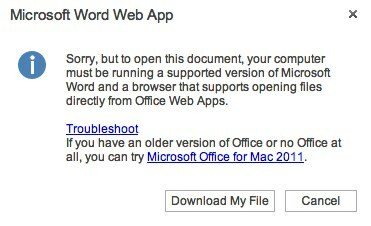 It offered the option to edit the document in Microsoft Word and the Word Web App. But I can only use the web app if I am subscribed to the service. This will not be an issue when Office goes live but we’ll use it as an example to point out the issues that have been an issue with Microsoft Office in the past. With this announcement, Microsoft is trying to push the notion that modern office is doing everything the old way but on tablets. It is not the future of work we all expect to happen with BYOD trend. If Microsoft has to succeed in the cloud game, they need to come out of their ages old licensing schemes and disrupt their business models completely. By sticking to the licensing strategy of past, they are going to miss the future (of work) opportunity. “I’d choose this over #google. and you can quote me on that,” he said. He says Microsoft is offering license convergence credits so users may use both Office 365 and the installed software. It may be worth the trouble for the power user but for most, Google Apps is just fine. If Microsoft fixed its licensing I think it would be a much different story.